How do I use the OSR Star Map? With the OSR Star Map (which comes with the OSR Gift Pack), it is easy to determine the location of your new star. Not only can the Star Map determine the location of your star, it is also able to reflect the visible celestial sky at a certain place, date, and time. In this article, you’ll learn how to find the star named One Million Stars in the night sky using the OSR Star Map. This example star has the coordinates RA 13h03m33.35 -49°31’38.1” dec 4.83 mag Cen. Keep these coordinates in mind as you continue reading below. Northern Hemisphere or Southern Hemisphere? The OSR Star Map has two sides: one side is used when locating stars in the Northern Hemisphere, and the other side is used when locating stars in the Southern Hemisphere. The map for the Northern Hemisphere is used above the equator (Europe, Asia, North America, and northern Africa). The map for the Southern Hemisphere is used below the equator (Australia, South America, southern Africa, and Antarctica). In addition, a number of arcs with degrees (15/30/45/60/75) have been printed on the transparent disc. These are degrees of latitude which indicate the boundaries of the visible field of the celestial sky. If there is a clear sky, it is easy to determine which arc to use by figuring out where the celestial sky is visible (more information on determining the visible celestial sky is listed below). 1. Determine which side of the Star Map to use, based on the hemisphere that is currently visible to you. In this example, we’re looking at the constellation of Centaurus, which is best visible from the Southern Hemisphere. minutes). This is the right ascension (RA). 3. Draw an imaginary line from this point on the outer ring into the center. This imaginary line has the same scale division as the other lines that converge towards the center. This way, you can determine the declination (dec). 4. Move along this line until you reach the -49 degree point (the scale has increments of 10 degrees). 5. 13h03m-49° is the position of the star on this star map. Mark this location so you can easily find your star on the map again at another time. 1. The transparent disc has a timescale that is measured in hours. The inner ring of the map has a day and month division. Turn the disc so that the line of the scale division of the time on the transparent disc (what time it is when you’re stargazing) corresponds with the block of the current date on the map. For example, try looking up 13 August at 23:00. 2. The section of the degree of latitude you have just determined is the celestial sky as it is visible at that particular moment. 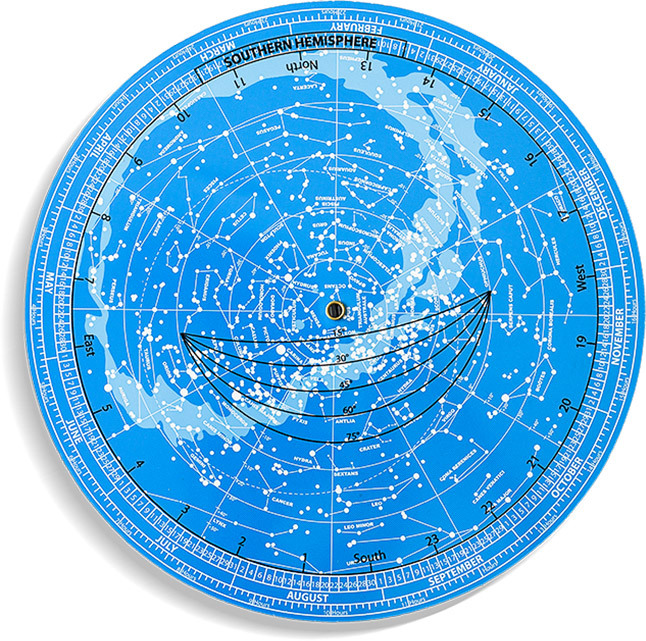 Now, point the north side of the star map (printed on the transparent disc) to the north. After some observation, you will recognize the celestial sky as it is visible at that point and time. Using the most visible stars, you can now determine the location of your star. There are many more ways to find and gaze at your star by utilizing all the latest technologies. If you’d like to learn about more ways to find your star in the night sky, please read this article. Name a star now! - How do I use the OSR Star Map?